January — Uncomfortable but hopeful. February — Hope seeping away. March — Devastated and trapped. April — Escaped, thank God. May — Decompressing; emotionally raw. June — Left at roadside. July — Picked up briefly. August — Rock bottom. Miserable. September — Some good ideas. October — Leveling out slowly. November — Waiting, hoping, writing. December — Door opened, finally. For 2009, now that I actually have an official academic field (and might still have yet another), I hope to be able to spend some more time here discussing it/them. Obviously, a lot of professional wind got let out of sails after March and April, and the blog as a result became much more of a personal exercise than I originally intended. I don’t expect that will go away, exactly, but I hope to have more to contribute in terms of academic discussion. I don’t plan on discussing original research in detail, exactly, but it would be very much in keeping with my original intent to be able to at least jot down some notes here. It’s possible I may have additional opportunities to post some travel journal kinds of things in the coming year. More on that as it happens. I really hope to have more to say about Pascha at the Singing School, and very soon. I’m so close to having a draft completed I can taste the cheese. There are other writing and musical projects that may or may not get anywhere as I have time to devote to them. As some things get completed, more capacity will be opened up. We’ll see. At any rate, I will be toasting the New Year with at least one Maker’s Mark Manhattan tonight. As I mentioned earlier, my Christmas present from Megan consisted of the means with which to roast coffee at home. Pictured here is the product of the first batch, roasted Sunday night. More pictures can be found here. 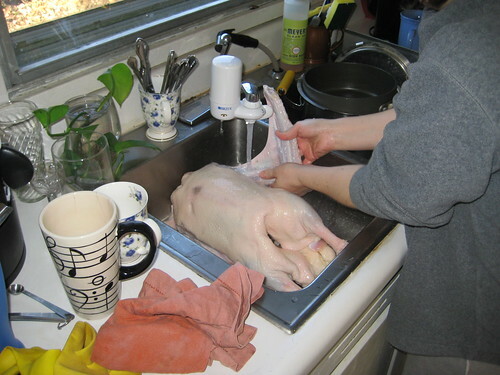 (For that matter, more pictures from Christmas and from goose-cooking can be found here.) 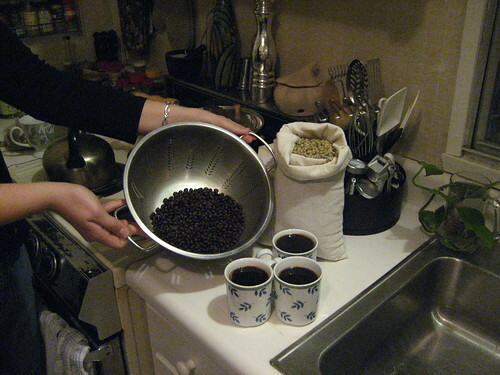 We also roasted a batch last night. Thus far, we’ve used the stovetop popcorn popper method; we also want to try the stovetop cast-iron method. What I can say is that it has not been appreciably difficult or time-consuming and the results have been quite drinkable. The flavor is different enough from your typical bag of *$$ (let me know if you don’t understand what I mean) that it’s definitely an adjustment, but so far it’s been an adjustment along the lines of “See, here’s how something you already like can do what it does better.” Perhaps it’s like being used to macaroni and cheese being made with Velveeta and then somebody comes along and makes a white sauce from scratch with Gruyère — and perhaps that’s an analogy that makes sense to me and me alone (like so much)… Anyway, the point is, flavor adjustment or no, I’m not sure there’s any going back. One other observation: I’m pretty sure the caffeine content is greater this way. How sure? Pretty sure. I think my wife has gotten to bed sometime around 4am every night since Sunday. And now I have a friend with whom we’ve started to have hushed conversations about home brewing. This all sort of started four years ago when I decided I wanted to bake our own bread — does it ever end? Wow, is it the last day of 2008 already? Couldn’t come soon enough. Retrospective to follow shortly. What, do you suppose, would the term be for the polar opposite of a self-fulfilling prophecy? Christmas Eve found me singing the services of the Royal Hours of the Nativity, as well as the Vesperal Liturgy of St. Basil, in the morning. We only started doing the Liturgy in the last couple of years, and last year I had to leave right after the Hours, so this marks the first time I’ve sung this particular service. The idea of the Royal Hours of the Nativity is one of my favorite services; it is, so far as I can tell, a Christmas service that is entirely ours and for which no other communion has an equivalent. I’ve always thought of it as a service that, in theory, could be a wonderful outreach if done really beautifully (of course, the same could be said of all of our services). Also the parallel of the hymn from Ninth Hour, “Today is born of the Virgin Him who holdest all creation in the hollow of His hand,” to the Fifteenth Antiphon from the Matins of Holy Friday, “Today is suspended upon the tree He who suspended the earth upon the waters,” is also one of those liturgical moments that reveals how carefully our ecclesiastical year is constructed. The execution of the Royal Hours tends to stress me out, however. The last couple of years in particular have always had little gotchas (or big gotchas, as sometimes is the case) — two years ago, for example, my priest forwarded me an e-mail from our bishop saying, “This is how we’re going to do the Royal Hours throughout the entire diocese this year; please make a note of it.” I dutifully prepared to do the service exactly that way, I made a verbal attempt to verify Fr. Peter and I were on the same page before the service, and I reached the end of the Royal Hours as outlined by the bishop only to have the priest continuing on with exactly the portion of the service I had not brought with me for the morning. He asked me afterwards what happened; I told him I was following the bishop’s e-mail that he had forwarded me. Without going into messy details, we’ll just say that the decision had been made to not change anything in consideration of it being Fr. Peter’s first year at the parish, and that this not being conveyed to me was, one way or the other, an oversight. Last year, the Vesperal Liturgy was added to the schedule immediately following the Hours; unfortunately, for whatever reason the Liturgy was scheduled for an hour following the Hours, and the Hours take somewhere close to two hours if sung as written. We sped through as much as we possibly could, cutting repeats, and it was still about an hour and forty-five minutes. This incident was unfortunately forgotten, and the same mistake was made on this year’s calendar. The solution this time was to sing the troparion and kontakion at each hour, then read rather than sing the stichera leading up to the prokeimenon. This got us down to an hour and a half. Then there’s the matter of our Kazan Menaion for December being in horrible disarray with a lot of things having been lost or removed over the years. I will replace that, with my own money if need be, shortly (assuming they still exist). Hopefully, one way or the other, all of these issues can be addressed for next year. Following the services for the morning, there was much goose-preparing, present-wrapping, cleaning and decorating to do before we returned to church for a chrismation, Nativity Matins, and Divine Liturgy at 8:30pm. 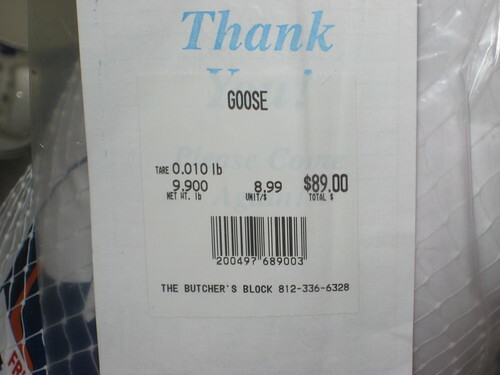 Goose, as it turns out, is on the expensive side. Being married to me has evidently done horrible things to Megan’s math, and/or her approach to thinking about food, and when she was asked how many people she was feeding when she ordered the goose, she added one plus one (her and me), and came up with the number seven. 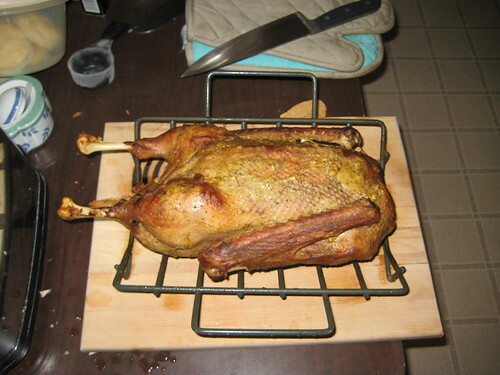 The resulting ten pound goose was, as you can see, not cheap. Ah well — if it had turned out terribly, it would have been a tragedy. As it is, we’re just fine with a few days’ worth of leftovers. I mentioned earlier the matter of brining the goose. This involved cleaning the bird and soaking it overnight in five gallons of water with lots of salt, sugar, peppercorns, bay leaves, cardamom, and so on. The exact recipe may be found here. It was not terribly difficult, but all the ready-making was time-consuming, and I found myself wrapping Megan’s presents just minutes before we had to head back to church. Matins and Liturgy were a good deal less stressful than the morning’s services, and set the Feast off well, I thought. Christmas is always a strange-feeling time at All Saints; college town that Bloomington is, a lot of people are gone, and even some people who are in town often stay home. To some extent, this underscores for me how Easter really is the main holy day on our calendar, and as much as the Nativity is a major feast, it just still isn’t as big of deal. Nonetheless, the Nativity Liturgy is the best-attended non-Sunday major feast at All Saints, even if it doesn’t pack the house the way Pascha does. We did have the nine-member family of a catechumen — which included a Pentecostal preacher. I was asked, seconds before we were about to start Matins, if there was anything with which he could follow along — having to think quickly, I handed the requestor an extra copy of both the Nassar book of liturgical texts (aka “the Five Pounder”) and the Antiochian service book. I still have no idea if that wound up being useful. Another part of why it’s strange, though, is that there is nothing in the Byzantine celebration of the Nativity that corresponds to what is done at the popular level in American society. We sing totally different hymns, we don’t do a “living Christmas tree,” and incense, candles and whatnot are normative parts of every service for us, not just for high holy days. All Saints has sung Christmas carols in the church following the dismissal, but in the last 2-3 years that’s fallen out of practice because we’ve started reading the post-Communion prayers at that point, so there’s not really a logistically clean point anymore where that might work. For my own part, I can say that the last thing in the world I want to do after singing Nativity Matins and Divine Liturgy is to start singing Christmas carols, for a whole host of reasons, not the least of which being that I’m vocally exhausted, and also that aesthetically it seems like it would be the most jarring transition possible. Still, I know it’s difficult for some people, that to some extent it doesn’t feel like the same Christmas everybody else is celebrating. I’m not sure what the solution is, if there even really is one. A nightcap of eggnog with bourbon found me before we hit the sack, and then that was that for the night. I think we finally rolled out of bed around 10:30am on Christmas morning. 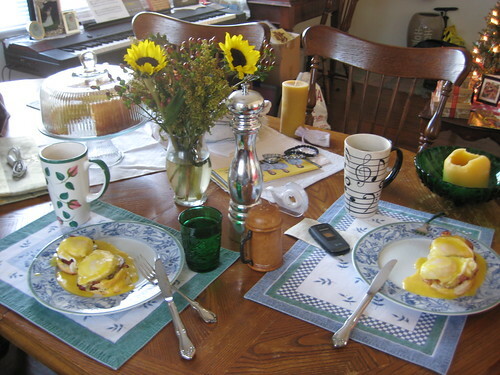 We opened presents — some festal icons for us, a couple of reference works Megan wanted, and then for me home coffee roasting supplies — and then what I was really waiting for: eggs benedict from scratch, with biscuits made from the buttermilk that Megan’s butter-making efforts from a couple of days before had yielded. Then it was time to start roasting a goose. Roasting a goose is less tricky than some might have you believe, but the incontrovertible truth is that there is a lot of fat. 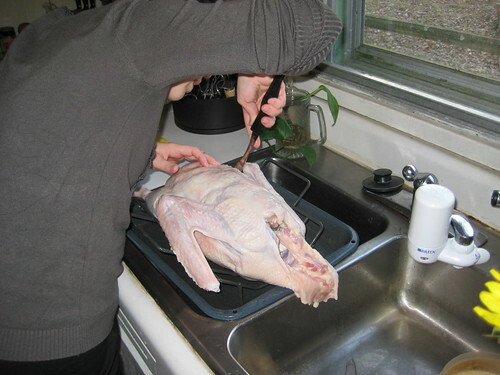 You have to prick a lot of holes in the skin so that the fat can drain out while the bird is cooking, and then you have to be immensely careful when pulling it in and out of the oven lest all of the drippings splash over the side of the roasting pan. 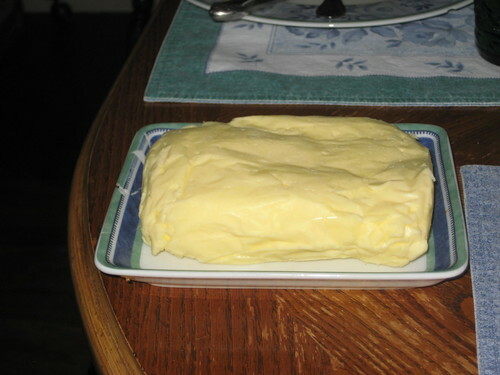 The plus of this is that goose fat is supposed to make fantastic mashed potatoes. We followed this recipe and liked it a lot; the one caveat I might mention is that the way the steps are organized, it is not made clear that the stock is a vital ingredient of the gravy until it is too late to go back and rectify the matter if you skipped over it. We were able to improvise so that all was not lost, and the stock made a really tasty soup a couple of days later, but do be aware of this. Also, the recipe assumes a thirteen pound bird; ours was a ten-pounder, and by the time we got to the last 50 minutes of roasting as called for in the recipe, our meat thermometer told us that it was already done. Next time we will attempt to recalibrate the cooking times to match up with the goose’s size. Anyway, one way or the other, the fowl was not foul in the least. My impression of how goose tastes is that it’s similar to roast beef as well as good dark meat on a turkey. We also had mashed potatoes, collard greens, and spinach, served with a very nice Lebanese red wine. Dessert was homemade pound cake. I also decided I was in the mood to read the Sherlock Holmes story “The Adventure of the Blue Carbuncle” aloud and in character; my reading of this story when I was seven or eight, after all, is the whole reason I ever had any idea there was such a thing as a Christmas goose in the first place, so it seemed appropriate. It was fun; we’ll see if this particular practice lasts. Friday, Saturday, and Sunday have, of course, seen us feeding a lot of people with goose leftovers. You can do all the same things with it as turkey; sandwiches, soup, and so on. As well as that’s gone over, maybe it was a good thing that Megan’s math was faulty — I look forward to doing it again. All Saints served the Divine Liturgy of St. James again yesterday, the Sunday after Nativity being the other day when it is customary (at least in some places) to celebrate it; I hope to be able to post pictures soon. It really is a beautiful Liturgy, I’m finding it very enriching to become more familiar with it, and far more people in the parish got to be part of it than did in October. I’m only sad that it’s going to be almost ten months before the next time we do it. And a new year is almost upon us. Thank God for that, for so many reasons. It is Friday of Finals Week; the campus is basically empty, it is grey outside and already hinting at getting dark. The next couple of weeks will be very quiet. While I generally like the winters here (as long as I’m not snapping the bones of my various extremities) I have found, particularly the last couple of winters, that I struggle somewhat with it being nearly dark out by the time I get home after work this time of year. It’s never bothered me before, so I’m not altogether sure what that’s about, but there we are. My one final this time around was Modern Greek. Confidence, I suppose, is when you know you would have to bomb the exam completely to impact your grade at all, and I didn’t bomb it in the least. Next semester I will be bumping up to the 4th semester of the sequence, which means I have some fill-in work to do between now and then, but I am reasonably unconcerned about my ability to deal with it. One of the problems I’ve been trying to solve this week has been that, upon realizing that my iTunes library was taking up 33 gigabytes of my 80 gigabyte hard drive, I decided to get a 1 terabyte external hard drive and hook it up to the wireless router that governs the connectivity in our house. Simple, right? Well, no. The router, one of AT&T’s custom jobs that you have to use if you have their DSL service, only has a Type B USB port on the back, and the output port on the MyBook drive is a Micro B. A USB hub didn’t solve the problem, because the only upstream port on the hub was, yep, a Micro B. A USB-to-Ethernet adapter didn’t solve the problem, either. Finally I pulled out the AirPort Extreme router I still have from my cable days, which has a Type A port on the back of it specifically for hard drives, and connected that to AT&T’s router via an Ethernet cable. It works now, more or less, but I don’t understand why this wasn’t easier. Now I’m migrating my iTunes library over, which will take another few days to sort out, I’m sure. A friend of mine in high school used to call such needlessly complicated arrangements “goat-ropes.” I’m still not sure what a “goat-rope” is, exactly, but I think this qualifies. And, of course, Leopard’s Time Machine functionality still doesn’t work with an external hard drive connected via a wireless router, and I wasn’t about to spend $500 on a 1 TB Time Capsule when an AirPort Extreme router plus a 1 TB external hard drive cost less than $300 combined. So, whatever. Under the category of miscellaneous observations — you know, Rick Warren certainly wouldn’t have been my choice if anybody had asked me to set up the invocation for the Presidential inauguration. (That probably would have been Metropolitan Jonah.) Still, I am bewildered by claims that his views are not “consistent [with] mainstream American values.” Now, his views are most certainly not consistent with what Ms. Kolbert’s values are, nor with what Ms. Kolbert perhaps hopes “mainstream American values” might someday be, but that does not make them inconsistent with what “mainstream American values” presently are. We have a real problem in this country, on both sides of the aisle, with acknowledging principled, conscientious disagreement; particularly where certain social issues are involved, the same assertion is made on both sides — “We’re talking about people’s lives. You either agree with me or you’re objectively hating an entire subset of humanity” (whatever group might be impacted by the social issue in question). Somehow we have to get past this and not be constantly assuming the worst about the people with whom we disagree and their motives. That bears repeating, I think. I believe wholeheartedly that the level of public discourse in this country will not improve until we can stop assuming the worst about those who disagree with us and what might be motivating them. “Baby-killer” and “bigot,” to use but two common examples, are labels that do nothing but shut down the conversation. They get used, not to further understanding, but to vilify. They identify as enemies and dehumanize those with whom there is ideological disagreement. They do nothing to identify common ground and attempt to find a way to co-exist. If nothing else, President-elect Obama’s choice of Pastor Warren seems to acknowledge this problem and seek to find a way to navigate through it. That his choice of Warren has angered some on the Left, and Warren’s acceptance has angered some on the Right, indicates to me that it might in fact be an effective move on the part of both men. Yesterday I was present for a discussion with somebody who very clearly believed himself to be better-informed than most and in possession of a privileged point of view, a puppet who was able to see the strings, and he made a lot of very sweeping generalizations about a great many things, clearly finding it incomprehensible that any educated, thinking person might disagree with him, thus making anybody who might disagree with him categorically uneducated and unthinking. This person might be broadly described as a Northeastern academic liberal; what was fascinating is that his manner and intellectual approach was virtually identical to that of an Alaskan neo-conservative who espoused almost perfectly antithetical views to me a few months ago. Both opiners dripped utter contempt for any who might see things differently; both were absolutely convinced that they understood reality. You know, real reality. The truth may very well be that, eventually, the center cannot hold and the United States must splinter. Perhaps that will happen in my lifetime, or my grandchildren’s lifetime. It seems to me, however, that we have to resist such an eventuality. Sitting at the same table as those with whom we disagree is the reality of being the secular, pluralistic, supposedly egalitarian society that we like to pat ourselves on the back for being; we have to co-exist, and we have to get along, even if every settlement has not yet been negotiated and ratified. The result may be messy, the result may be something with which we’re not always happy, but that’s the nature of our system. Agreeing to disagree is the only way civil discourse can happen in the long run. Now I get to spend the next couple of days researching how to brine a goose. Watch this space for details. So, a week ago, I was making hummus from scratch. I was using dried garbanzo beans to start with rather than canned — and by the way, two cups of dried garbanzo beans yields six cups of cooked; this means that if you want two cups of cooked, you should start out with 2/3 cup of dried — and I was relying upon the opinions of more qualified individuals than myself as to whether or not the garbanzo beans had been cooked enough. “Sure, why not?” the more qualified individuals said after they’d been cooking for an hour, so I drained them and dumped them in the KitchenAid 5 speed blender we had been given as a wedding present almost eight years ago. Perhaps this setup tells you all you need to know about what the above photo represents. Perhaps you even see the little black rubber clutch with its teeth all broken? Well, anyway, we now know that the garbanzo beans were not, in fact, cooked enough. Thankfully, we immediately discovered that replacement clutches were not hard to come by; it’s part #W916840 and can be ordered off of the Sears website. I bought two just for good measure, and they arrived on Wednesday. The instructions which arrived with the part made it sound very simple; screw off the old coupler, screw on the new one. Perhaps you have also noticed the abundance of tools in the photo above, including a second pair of needlenose pliers intended to brace the axle on which the clutch turns while we were attempting to get it to screw off (and telling it, constantly, to screw off). The wounded finger is Megan’s; she got nicked by a metal shaving from the base of the clutch (pictured above, having separated from the actual rubber portion). 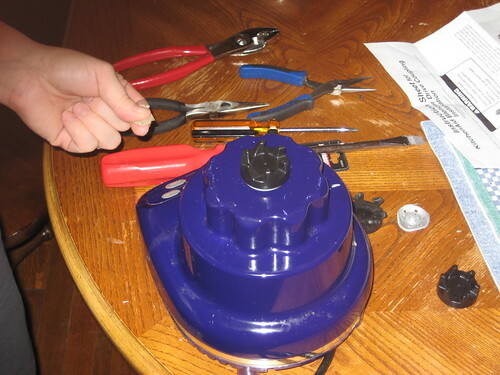 After a couple of hours of trying this and that, we finally got it off with more or less brute force — using the large pair of pliers, I bent the metal base away from the axle and thus also away from the threads. It then just popped off. We then tried to attach the new coupler, and in so doing made a fascinating discovery which explained immediately why we had been having so much trouble. You see, in the case of this particular part with these particular threads, what we had assumed to be the universal constant of “lefty-loosey, righty-tighty” simply did not apply. In fact, it was exactly the opposite. Not that the instructions which came with the part even gave so much of a hint regarding this, of course. The good news is that a) the blender works again and b) nobody else ever has to lose the war for want of this particular horseshoe nail. If you can’t get the coupler off, try turning it the other way. It may change your life. I was in error — at least one major news outlet finds Metropolitan Jonah to be newsworthy, even if it is the paper written for and by five-year-olds (as evidenced by some of the comments).